Are you tired of having to post stupid views to twitter on your own? Well now, YOU DON’T HAVE TO!!! Simply navigate to the app HERE and smack the button. You’ll be prompted to log in if you aren’t already, and then to give permission for my app to access your account. 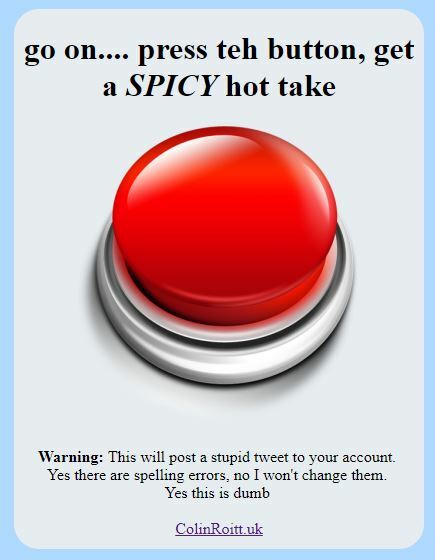 The app then generates a hot take and tweets it out for you. Just to save you some time in stirring up some online debate. Next Next post: Sod it, we’re rating the pastas….